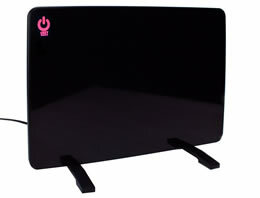 Our Best-Selling Radiant Flat Panel Heater combines both radiant & convection heat to keep you warm. This powerful heater is completely silent, while only using about 13% the electricity of a standard 1,500 watt space heater. Heats your office space using both radiant & convection heat. Uses just 100 watts – 87% less energy of a traditional 1,500 watt space heater. Our Flat Panel Heater primarily uses radiant heating technology which is the transfer of heat from one object to another. In other words, warmth comes from being in very close proximity to the heated panel. This makes it the ideal combination of low power consumption and perfectly balanced heat. As a certified zero-clearance item–Flat Panel Heater reduces energy consumption, tripped circuit breakers, & fire hazards. Save energy. 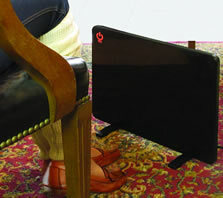 Typical space heaters use 1500-2500 watts while the Flat Panel Heater uses only 100 watts (Low Setting). Reduce risk. Space heaters are known to cause fires & blow circuit breakers. is a safe, energy-efficient, ETL certified Zero-Clearance item. Stay warm. Keeps you warm so you are more comfortable & more productive at home and/or work.